This year, the coveted Turner Prize is being held at Baltic Centre for Contemporary Art in Newcastle-upon-Tyne, and since it's on the door step, I took a couple of hours out of my Gallereo day to go an make up my own mind about the whole thing, before the winner is announced on the 5th December. Firstly, I would say that the Turner prize has come under a lot of criticism in the past about the nature of the art selected, and the fact that painting is often a neglected medium, even though the prize is named after perhaps one of the greatest painters of all time. This year, we can safely tick the painting box in terms of what is included in the show. George Shaw is one of the nominees of this years Turner Prize and is known for his urban paintings of rundown, neglected parts of the UK, and in particular Coventry, where he grew up. The collection of paintings on show as part of the Turner Prize are particularly dull and downtrodden in subject matter and rendering, but they have a certain draw and interest about them for the viewer. I could easily recognise and relate to the subject matter from local areas that were, and in some cases are, in the same state of disrepair and neglect as those in the paintings. The atmosphere of the paintings captures a certain feeling towards these areas around the outskirts of new housing developments, or of great older buildings that are set to be demolished. Then there's the familiar geometric repetitiveness of sets of garages on estates, and roads and pavements that have seen better days. This isn't grand subject matter that painting was once accustomed to, this is real life; documentary of the true state of the places around us. The places that we drive by and don't think too much about, or the places that we'll choose to forget once something else begins to dominate our local landscapes. 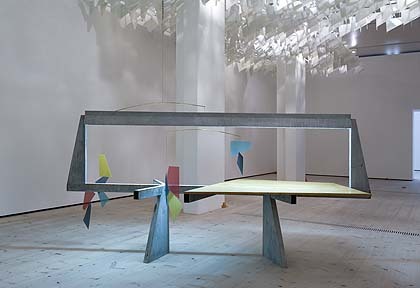 While Shaw's paintings occupy the final room of the Turner Prize showcase, it is artist and sculptor Martin Boyce who is presented first to the touring public. The room is sparsely filled at ground level, other than a large table construction at one end which looks like a cross between an Alexander Calder sculpture, something that David Smith might have started to piece together, and something that you would find on the set of Beatle Juice. I liked it, it would definitely make for a good conversation starter at the next dinner party if it had pride of place in the dinning room. The room was atmospherically lit, and a glance up to the ceiling revealed an interwoven grid of sculpted metal that gave the impression of a think overhead covering of leaves on a tree, with a dim light shining through. All in all it made the room incredibly cosy and a total experience of the space, rather then an experience of each individual item of work. The paintings on the wall, surrounding the table, were very reminiscent of Frank Stella, in their geometrical construction, or even of Jasper Johns in his grey period. The mix of Calder, Smith, Stella and Johns makes the room a very Americanised experience, like walking into a gallery at the Whitney Museum in New York City. Following on from Boyce was the video work of Hilary Lloyd, and while we've taken more and more to video art over the years, this room seemed unremarkable and quite forgettable in comparison. This was made worse having then been able to walk into the child-like sensory wonder world created in the next room by Karla Black. Lloyd seems to present the weakest entry for the Turner Prize, with the view out of the window of the 3rd floor of the Baltic seeming to win more spectators than the video installations themselves. Perhaps she was hard done to in terms of placement, or perhaps it's just each to their own in terms of what presses the right buttons in a show like this. Having seen the Karla Black installation on the news previously, there were seriously mixed feelings walking into the room. Would it make any sense, was it a justifiable creation, was it really just going to look like a Lush store had exploded in the gallery space. Thankfully, it was easy to connect with the work once in amongst it. The big paper accumulations were like secret dens made with bed sheets and the powder on the floor was like that 'accident' you had as a child grinding sticks of chalk into pretty much any surface because it looked nice, and you enjoyed it. Only this time, you could witness the whole thing and not be told off for the mess. Much like Boyce, the sensory appeal of the room overrode any individual aspect of the artwork. It was a true representation of art mimicking life and offering a play room of child-like feelings and experiences to everybody that walks through the door. Having gone into the Turner Prize show at Baltic with a fair bit of skepticism, as I'm sure many people do, it was possible to emerge at the other end pleased and relaxed about the whole thing. Maybe you wouldn't want to hang most of it on your wall, in fact you wouldn't even be able to try with most of it, but if you can walk into the gallery and go into any one of those rooms, and be able to say, 'that was great, it reminded me of when…' then you will perhaps be a step closer to experiencing the 2011 Turner Prize in the same way that I did. As for who should win the prize this year; before the show, Shaw was far ahead at the top of the list, for no other reason than it would be great to have a pure painter come out on top this year, but after visiting the show, it still goes to Shaw, but now, only just.